The authors of the first study above indicate their goal of developing sound, reliable measures of quality of life for ET patients. Yay! Both articles have results of study questionnaires where participants self- reported on their symptoms. In the first study participants reported on the negative physical impact of their tremor, the psychological impact, and tremors’ impact on communications, work/finance, and hobbies/leisure. Factors used in the second study were depression, personality traits, psychiatric components, coping strategies and a quality of life health survey. It is commendable in the first study that the data are specific to the body location of ET symptoms, meaning that voice, head, arm and leg tremor results are included, not just hand tremor. As would be expected of those with voice tremor, the data show the severe impact their condition has on communications. And in the second article, the study authors make note of interesting results that show significant, negative psychosocial impact of ET that is not closely associated with or dependent on the severity of the tremor. This means that even if physical tremor symptoms are not considered severe, they can still have a hefty, negative psychosocial impact. Overall it appears self-reported questionnaires are developing into something meaningful. The clinical researchers or study authors are hopefully connecting some dots, having learned about the physical, social and neuropsychological components of this condition, and knowing more clearly now how everyday life is impacted for the ET population. Click on the links for more information about the individual studies (but be forewarned it is not easy reading). We link to Mayo Clinic’s award-winning website for knowledge and health information: MayoClinic.org Essential Tremor Information. The paper developed out of a workshop these professionals attended in May 2015 and their subsequent brainstorming discussions. The non-profit ET patient advocacy organization HopeNET, which has for several years sought to connect the ET patient community to the medical research community, proudly played a role in the occurrence of the workshop, which was hosted by the National Institutes of Neurological Disease and Stroke (NINDS) in Bethesda, Maryland, USA, and included over 60 participants. The resulting paper is a valuable guideline for the future. It is certain to be of interest to the ET community who will be glad to learn that medical professionals are indeed working to further knowledge of this movement disorder! The summary below serves as a layperson’s general overview of the detailed paper to convey information in terms that are more understandable to a general audience. Science-curious readers can pursue the paper in full through ScienceDirect here . The causes of ET are poorly understood. Despite widespread occurrence, no medications have been created specifically to treat it. The goals of making ET less elusive and coordinating research efforts were driving forces behind the workshop discussions. One big challenge is limited knowledge about both the genetics and the neural pathway mechanisms involved in ET. Another has to do with inconsistencies in making an ET diagnosis. The fact that ET has multiple causes makes any simple definition of it inadequate. Clinical research methods and approaches have been inconsistent. And without standardized procedures in place, analyses and findings disagree. The authors do an excellent job of taking an in-depth look at what they do and do not know about ET. Perhaps most importantly they take it a step further: they come to a consensus on recommendations for research in these areas: phenomenology and phenotypes, therapies/ clinical trials, physiology, pathology and genetics. The authors recall the classic ET definition given roughly 20 years ago, as set forth by the International Parkinson and Movement Disorder Society (MDS). They mention that since that time there has been speculation about other characteristics that may need to be added to the definition such as, modest changes or abnormalities in these areas: cerebellar , cognitive  and hearing function [4, 5], plus dystonia . The authors discuss how it is common for ET patients to present with new symptoms that do not fit in to the existing ET definition, changes that call into question the validity of the diagnosis. ET also appears to share overlapping features with other conditions . New symptoms and overlapping features have encumbered clinicians, but they still believe a revised, workable definition is necessary clinically for the purpose of making inroads and facilitating important collaborative research. They agree on new criteria and propose that ET going forward be considered as an isolated tremor “syndrome” rather than a single disease or condition since it has been established that ET has multiple causes. Bi-brachial pertains to the 2 arms. Postural refers to holding a limb against gravity as in for example, holding arms out in front of the body, and kinetic refers to tremor that occurs when in action. The authors acknowledge that there are isolated tremors that do not meet the proposed ET criteria. They make clear this clinical ET definition is not meant as a detriment to continued research on other isolated tremors. Given the absence of an identified ET gene or an identified biomarker to help with a diagnosis, emphasis is placed by the authors on gathering and classifying symptoms as fully as possible, with quality data collection and standardization efforts in place, including use of common data elements (CDEs). 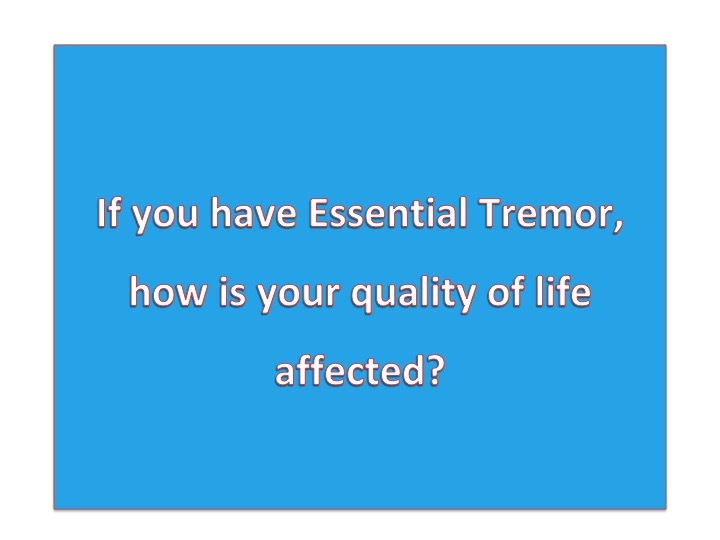 How is tremor measured in a clinical setting? Various tremor rating scales are used and the authors are calling for their evaluation. The rating scales include clinical assessment scales, patient-reported ratings/scales, and motion transducers, which are those devices that measure tremor amplitude or severity. Recommendations are made for development of a tremor monitor, among other technological devices. It is however pointed out that gaining insight from measuring the tremor is not as conclusive as it would seem since tremor amplitude or the severity of the oscillation can fluctuate at various times and the significance of those fluctuations is not known. Regarding therapies or treatments for ET, the common drugs presently used were created to treat other conditions like epilepsy, high blood pressure and anxiety and were repurposed for ET when found to reduce tremor in some people. The paper explains briefly how these agents are thought to work at the cellular level. Besides the commonly used beta-blockers, anti-epilepsy drugs and benzodiazepines, clinical research has established ethanol, aka alcohol, as effective in its ability to reduce tremor amplitude for many people. Its effectiveness has led to studies in past years that isolate ethanol-related molecules such as sodium oxybate, 1-Octanol and octanoic acid, and these may turn into possible future treatments. They also seek to better understand how certain surgical interventions have met some success in reducing tremor: deep brain stimulation (DBS) and magnetic resonance focused ultrasound, both of which target and lesion the ventral intermediate nucleus (VIM) portion of the thalamus in the brain. At the physiological level, researchers have identified a particular central nervous system circuit they think may be responsible for tremor oscillation in ET called the corticobulbocerebellothalamocortical circuit, and they are calling for investigation of it. Genetics research findings make clear to the authors that the path to increased ET knowledge may be found in focusing on large patient cohort studies worldwide in order to make certain associations. Background is given on some important studies that have been done such as the Icelandic genome-wide association study (GWAS) that suggests the gene LINGO1 has possible associations to ET . Common data elements, collection and storage of DNA bio-samples and coordinated multinational efforts are strongly encouraged. The paper builds an awareness of scientific research being done in the ET field. The workshop provided an opportunity for experts to discuss present-day ET challenges. The authors discovered shared goals that ultimately revolve around deepening knowledge and making new treatments available, improving data, standardizing approaches, and evaluating therapies. It is a guideline for future research projects that, if adopted by researchers, could see momentum build in the direction of better outcomes for ET. J. Benito-Leon, A. Labiano-Fontcuberta, Linking essential tremor to the cerebellum: clinical evidence, Cerebellum 15(3)(2016) 253-262. [4, 5] W. G. Ondo, L. Sutton, K. Dat Vuong, D. Lai, J. Jankovic, Hearing impairment in essential tremor, Neurology 61 (8)(2003) 1093-1097. Benito-Leon, E.D. Louis, F. Bermejo-Parmejo-Pareja, Neurological Disorders in Central Spain Study, Reported hearing impairment in essential tremor: a population based case-control study, Neuroepidemiology 29(3—4)(2007) 213-217. J. Jankovic. Essential tremor: a heterogenous disorder, Mov. Disord. 17(4)(2002) 638-644. 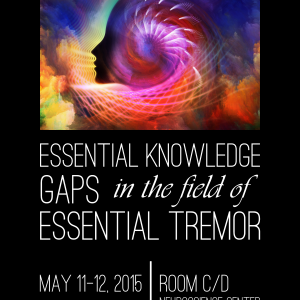 R.J. Elble, What is essential tremor? Curr. Neurol. Neurosci. Rep. 13(6)(2013) 353. H. Stefansson, S. Steinberg, H. Petursson, O. Gustafsson, I.H. Gudjonsdottir, G.A. Jonsdottir, …, K. Stefansson. Variant in the sequence of the LINGO1 gene confers risk of essential tremor. Nat. Genet. 41 (3)(2009) 277–279. As I have related before, there are other symptoms of Essential Tremor (ET) beyond the shaking of hands, head and voice. It is an area that requires much more research. In HopeNET’s groups, the issue of migraines has come up a number of times. In the meantime, my daughter who supposedly does not have ET has suffered badly from migraines. As my ET is hereditary, she & I had discussed the connection between ET & migraines a number of times. Then she found this article doing an internet search and forwarded it to me. It substantiates the connection between ET and migraines. This raises another important issue of children who supposedly don’t have ET. Do all the children inherit ET to some degree? This question needs to be answered, and if so, what is the effect? I welcome any comments you have. Background: The existence of an association between migraine and essential tremor has long been controversial. The prevalence of migraine in essential tremor patients was surveyed to explore the association between the two diseases. and migraine was obtained using a structured questionnaire at a face-to-face interview. Moreover, a functional variant of the dopamine receptor D3 gene (Ser9Gly, rs6280) was studied in 46 essential tremor patients with and without migraine using direct sequencing analysis. Results: The prevalence of lifetime migraine in essential tremor patients was significantly higher than that in controls (22.0% vs. 12.7%; p¼0.035; odds ratio¼1.95; 95% confidence interval¼1.05–3.60). No significant difference was found in the migraine features between the essential tremor and control groups and most tremor characteristics were no different in essential tremor patients with and without migraine. A higher male prevalence of essential tremor patients without migraine was observed. Moreover, 44 of 46 (95.7%) essential tremor patients had the dopamine receptor D3 Ser9Gly variant, but no significant difference was found in the frequencies of the variant between essential tremor patients with and without migraine (87.5% vs. 100.0%; p¼0.22). Conclusion: Our data suggest that essential tremor patients have a higher risk of lifetime migraine than do controls and the dopamine receptor D3 Ser9Gly variant may be lower in essential tremor with migraine than the general essential tremor patients. It is well-established that during goal-directed motor tasks, patients with essential tremor have increased oscillations in the 0–3 and 3–8 Hz bands. It remains unclear if these increased oscillations relate to activity in specific brain regions. This study used task-based functional magnetic resonance imaging to compare the brain activity associated with oscillations in grip force output between patients with essential tremor, patients with Parkinson’s disease who had clinically evident tremor, and healthy controls. The findings demonstrate that patients with essential tremor have increased brain activity in the motor cortex and supplementary motor area compared with controls, and this activity correlated positively with 3–8 Hz force oscillations. Brain activity in cerebellar lobules I–V was reduced in essential tremor compared with controls and correlated negatively with 0–3 Hz force oscillations. Widespread differences in brain activity were observed between essential tremor and Parkinson’s disease. Using functional connectivity analyses during the task evidenced reduced cerebellar-cortical functional connectivity in patients with essential tremor compared with controls and Parkinson’s disease. This study provides new evidencethat in essential tremor 3–8 Hz force oscillations relate to hyperactivity in motor cortex, 0–3 Hz force oscillations relate to the hypoactivity in the cerebellum, and cerebellar-cortical functional connectivity is impaired. There is no medication available that has been designed specifically for Essential Tremor. The National Institutes of Health studied One Octanol/ Octanoic Acid for about ten years before putting the study on hold in May 2012. As I participated in several stages of the study, I know it works and is safe. It is very important that this study be completed, and people with Essential Tremor finally have a drug designed for their condition. In introducing our guest speaker, Dr. Maguire-Zeiss, Peter mentioned he recently heard her speak to the Falls Church support group. Being a part of the American Brain Coalition, he thinks having a wider perspective of what’s going on in neuroscience will lead to better treatments for Essential Tremor (ET). Dr. Maguire-Zeiss mentioned that a large part of the attention in neuroscience goes to Alzheimer’s disease and filled us in on her background that includes working mostly on Alzheimer’s and Parkinson’s disease. What she’s studied she believes is applicable to other diseases where neurons are dying. Her undergraduate degree in biochemistry was followed by graduate school and a PhD at Penn State University. Her postdoctoral training was at the University of Pennsylvania. Her late husband passed away from a brain tumor – in her career she works to study the brain. She explained the basics to us, that the brain has 4 main cell types that do things involving intention to move, moving, controlling movement, thoughts, and consciousness. The main cell types are split into two groups: glia and neurons. Glia can be broken down into 3 types of cells: microglia, astrocytes, and dendrocytes. The word ‘glia’ in Greek means glue so for the longest time people thought it did what glue does, keeping things in place. We now know each of these cells has a special function and that your brain would not work without them. We’re very inventive as scientists, so microglia are the smallest ones, astrocytes look like stars, and these oliodendrocytes make a special protective coating around your neurons to help them function. Neurons are really important because they carry the info you need. They receive process and send information, therefore having a big function. There are a lot of different types of neurons. I like to think of a neuron like a tree in the spring before all the leaves form. You have these main branches and then off of these branches you have the smaller ones. Then you have one large straight branch. This part that looks like a tree without branches (drawing) is where the cell receives its information (dendrites). This is where you process and send information. So we have special names for these. There’s a tree that has these little protrusions everywhere that later make blossoms, and remarkably dendrites have these little protrusions too and they’re called spines. So there is lots of this everywhere. The spines are areas where other neurons talk to these neurons. This is what you call a cell body. It takes this information and says it has to do something with this, like make a protein or something, and then it sends the information down here to what is called an axon. Each neuron has one axon and that axon goes to wherever it’s supposed to go. So for instance in your brain if you want to move your arm, one neuron will receive information from another part of the brain that says, I want to move my arm, and then it sends that info through these to the cell body. Then this guy sends the message to my spinal cord where it controls my arm. These long axons are really important – the info has to be sent a really long way so they need a lot of energy (just like if you would if you went for a longer run verses a shorter run) which comes from up here (the brain). If this guy’s not healthy you don’t have enough energy for this. So these guys end up coming into this area (they look like little buttons so we call them buttons). Those little buttons come over here and there’s another cell here. The cool thing about the brain is we have between 10 to100 billions of these neurons in our brain. You add these to it, we call them synapses, and we have trillions of these connections in your brain. So these guys (microglia) are all around here doing different things: microglia is like white blood cells that attack a foreign object. There’s a tight barrier called the blood brain barrier wrapped around the brain and you guys probably know that some of the drugs you take will cross or won’t cross that barrier. That’s really important because if you didn’t have that barrier and had a cold. Then all that bacteria would go in your head too and that’s really bad because it’s in this closed space. Because the white blood cells don’t get in there, they’re job is to take care of things that sneak in there. Also, cells die and get damaged: those guys (microglia) are like little pac-men, they chew up and eat debris as they’re moving all the time in your brain. There’s a really cool YouTube video where you can see them moving around. We call that, they “survey”. That’s their main job. What we find is in diseases they do it too much. These guys, the astrocytes, they help support this whole system. The way these guys normally talk to each other (the axon and the spine that’s on the dendrite) is this guy has chemicals that he releases. Then the spine has little receptors for that chemical, specific ones that only bind that chemical – that’s how they talk. But they dump it out into this area, synaptic cleft, dumping those neurotransmitters there. So these cells (glia) take up these neurotransmitters. These guys help to make this work better, they encapsulate it with a protein and lipid combination called myelin, and they insulate this axon. When you insulate something like an electric wire, you can send the electricity signal much faster. And that is what our bodies have done. If they didn’t do this you’d have to have a very big axon to carry all that information. If you’ve ever seen a giant squid – they’re invertebrates without bones and they make these giant, very big axons, thicker than a pencil. If you had to have a hundred billion pencils in your head, how big would your head have to be? So we’ve evolved to have this insulator. So now we know what they look like and how they talk to each other. Then the idea is how they work in your brain. If I took a picture of a brain it looks like this (cross section drawn). If you’re talking about moving since that’s what I’m interested in in the lab, there’s a part of your brain called the motor cortex that helps you with moving. If you map out the motor cortex, there are spaces in here for your feet, knees, arms, trunk, hands (a really big space), and there are spaces for your tongue and your eyes. The ones that have more movement and really precise movement have a larger part of your cortex – for example, your fingers because it takes a lot of effort to move. This is called a homunculus. How do we know that these areas are involved? We’ve done research. If you have a person who’s had a stroke (for every person a stroke is different), it depends on where the stroke occurred and where the blood supply was limited and what died. So if you had a stroke in an area that controls your arms on one side of your brain, then you’ll have someone who has a hard time moving their arm. They will subsequently have to keep practicing and doing things over and over again. So they’ll recover a little bit but probably not completely. This is how we have learned how the brain works. If you want to move your arm, you would have to have info from this area of the brain and it has to get down here to the area of the spinal column that controls the arm. It doesn’t really get interrupted by anything – it is one synapse and one set of neurons that control your crude movement. It’s good in the sense that it’s fast and it’s bad because there’s nothing helping it along the way. If you damage it up here you really have a lot of damage. But remember we have to have information from the outside coming in. For example, to tell you that’s an uncomfortable way you have your legs crossed – so I want to move. We call this sensory information and it comes in a different way but ends up right around the same place and talks back to it to help control it. So what happens in Parkinson’s or Essential Tremor is all that circuitry going down is functioning okay but what’s not functioning very well is the area in between. So let’s look at the brain this way (drawing). This is the cerebellum. And this is your frontal cortex which controls you from doing dumb stuff .This area is in the middle of the brain acting like a black box and we call it part of the midbrain structures. So what happens in these areas if there’s damage – it’s not like you can’t move it’s just that you’re not moving the way you want to. You either have a tremor at rest, an intention tremor, or one that’s there all the time but worse under those two circumstances. And there are two areas of the brain that control fine movement, for example, if you want to pick up a cup of coffee and bring it to your lips. You guys are all aware of that I’m sure. One area is called the basal ganglia. So if we look at it as an engineer, this is the motor cortex. In order to move it needs another area of the cortex to say, I want to move. It doesn’t just spontaneously move. It needs information. So in this circuit that information comes down to another area deep in the brain here that we give another name to, the striatum. This area has two pathways with both of them ending up in the same place. We call them direct and indirect pathways. They help us to balance what to do and help control the movement. All that information goes into another place involved in Parkinson’s and ET, called the thalamus. That’s your relay center so that’s the area that sends your information back up here to say this is how I want to make the movement – I want it to be a smooth movement, or I want it to be a jerky movement, however I want to have it. And when it doesn’t work that’s when you have movement problems. In Parkinson’s there’s this area of the brain that has a neurotransmitter called dopamine and it controls this. In Parkinson’s those neurons die and because of that Parkinson’s patients aren’t getting the right information to this part of the cortex so they can’t start moving. If you want them to walk and they just hesitate, you have to distract them somehow. There is a trick we can use for the brain to get them to go. If you clap in rhythm they walk in the rhythm of the clap to get started. Another problem these patients face is tremor at rest. Clinical doctors will rate tremors different ways by how fast the tremor is. Most of the Parkinson’s patients who first go to the clinic have already lost a lot of their neurons; about 80% of their neurons have died. The plus is that it’s remarkable they have a little tremor and still have a lot more neurons there than they really need to have normal function. So if we could just diagnose them a little earlier then a lot of the treatments that we know work really well to save those neurons are going to make all the difference in the world for them. So we have lots and lots of people at Georgetown and all over the country looking for what they call biomarkers, ways to know if you have the disease before you have that first symptom. In Parkinson’s we’re getting clues about the rest of the body. What clinicians do is create histories of these patients and what’s come to the surface is that a lot of Parkinson’s patients have REM behavioral sleep disorder way before they have the disease. Normally when you or I are asleep we are paralyzed. We have dreams but we don’t do anything about them. With REM Behavioral Sleep Disorder, you don’t’ have this shutoff so if you’re having a fight in your dream, you’ll punch the person next to you. I guess they just push each other and say, “Hey you’re having a dream”. What they found is that this happens 5-6 years before the tremor. Another thing Parkinson’s patients get way beforehand is constipated. Now you can imagine saying to your physician I’m constipated and him saying, “Oh you have Parkinson’s”. No, he has a list of other things before that. So several groups are looking closer at histories and, are checking people who’ve had a colonoscopy. Looking at biopsies of pre-Parkinson’s patients they have some pathology. There is a certain protein that’s also in the patient’s neurons. So now we’re getting this idea that it’s not just happening in the brain, it’s starting in the gut. We have other types of minor changes when put together look like they have Parkinson’s before they have the disease. That’s really important because it gets at how we can treat these patients with peptides and proteins that can save those neurons. The problem is when we take it to a clinical trial they’ll only allow us to do the trial on patients who have had every other type of treatment. By then there are no neurons for us to save. So we have to change the whole culture about how we do things. That’s one big hurdle I’m sure is the same in every disease we’re trying to study. In my lab studies, in this whole process I’m asking, what are those glia cells doing. They have to be important in this. What we discovered is that in these areas where neurons are dying, the glia cells are very active and they’re dumping things out into the environment that are killing neurons. So we’re trying to understand that particular pathway and how they get activated. It looks like they get activated by the bad protein that was in the gut that’s also in the neurons. When they release the protein they create bad cells – so we’re trying to block that. So you may have seen news about clinical trials for Alzheimer’s, Parkinson’s, Huntington and ALS where they give them anti-inflammatory drugs that didn’t work very well. It worked well with mice in the lab but not with people. One reason we think is because we’re not getting the right pathway. So we’re trying to narrow that pathway. Another reason is it may not be good to block all your ability to have inflammation because if you have another infection that would be a problem. In Parkinson’s that’s what we think is happening. In ET, the cerebellum sends info to the thalamus which sends info back to the motor cortex. It’s in this area I think that they believe is where the biggest problem occurs in ET. And there are a couple different types of neurons in this area that are being studied. They are cerebellar neurons: one’s called dentate (they look like teeth) and they send information to another area called Purkinje cells. It’s the cross talk in there that they think is messed up. That’s why some of you may be on a replacement for the neurotransmitter GABA, because that’s the neurotransmitter that talks to these two. Again, if there’s an interruption here, then if you get to the motor cortex you can no longer have normal movement. The job of this guy (GABA) is to prevent a lot of movement. Without it there to dampen it, you don’t have any control of your thalamus so it wants to move all the time. It’s the loss of really good control that gives you the tremors. Another disease you may have heard of is Huntington’s disease – they are moving all the time and it’s dramatic. Once you’ve lost control of this major relay center then you’ve lost all your fine movement. So how do we study this better? We’re good at a couple of things: looking at a specific neuron under a microscope, or growing them in mice. We can even put an electrical probe in them and understand how they talk to each other. So we’re good at one cell measurement. Another thing is we’re able to do pretty well are functional MRIs – where you’re in a scanner and we ask you to do something or show you something. We can see what areas of the brain light up when you’re doing or thinking of a specific task. In fact that’s how they figured out that in the motor cortex there’s info needed before you make a movement. They had patients in the MRI do a specific routine of finger movement and two areas of the brain lit up when thinking about the task and doing the task. Then they had them just think about the task. So what does it mean when it lights up in the MRI? When we’re trying to figure out what area of the brain does something it’s usually some kind of compound that gets converted to glucose – because your brain needs a lot of energy. Your brain is pretty small compared to the rest of your body but it uses 20% of the energy of the body, it uses a lot of glucose. What we’re not good at is understanding what that means. If you had an MRI and you had a memory test one area might light up. There’s this guy named Brodmann and he mapped the whole brain. There are 42 Brodmann areas and each one is related to some task. Your temporal lobe is the area for memory. If it lights up, it tells us some neurons there are important. But we don’t know what’s in the whole group of neurons. The only way to know is to look at postmortem tissue and use all these different techniques and it would take a really long time. So that’s where the Obama Brain Initiative comes in, they decided we need to understand how all these areas of the brain are talking to each other. They want to map the brain. What they plan to do is understand the connections. We’ll start with animal models. One example of what they’ve done so far is a technique called Clarity. You take a mouse brain and it looks very pink and you can’t see through it. There’s lots of tissue as the brain is made up of cells and a lot of fat. They took the mouse’s brain and put it through a couple of chemical baths. Afterwards you could see through it. They got rid of all the fat and you could see all the cells still in suspension in the brain. It’s the most amazing thing. What’s the beauty of that? Well we have a lot of techniques that will allow us to look at certain sets of neurons because we can make certain neurons different colors. Plus we can see where they go in 3 dimensions. So this is an example of the power that can come out of this Brain Initiative. Another technique developed by this researcher involved using two different mice. When mated he got a mouse whose neurons in one specific area were a certain color. He could knock out genes or stop them from being expressed. So this is very powerful. So this initiative should hopefully make a big difference. Even when you have critics saying you’ll only get a little information, I’d say it’s better to get a little information than none. A question was posed as to whether there are indicators for ET that are similar to the ones found in the gut for Parkinson’s. Dr. Maguire-Zeiss said she doesn’t think so but wants to show us something about that process and why that’s important. In PD they have a protein called alpha-syncline which has been linked to familial disease. So there are a small group of patients that have a mutation in this gene, and they go on to have Parkinson’s. So once we knew this protein was involved, the field exploded and people did everything they could with this protein. This protein is small and it doesn’t have any structure to give it its function. This is very unusual. We made knockout mice that never had it. As not losing this protein did anything, it must have been a gain of toxic function. So then people started investigating how that can be. And what we noticed was in PD the neurons under a microscope had these things that looked like perfect circles in these neurons. They named it after the person who found it, a Lewy body (see black circle in picture of cell with nucleus). When they found out about this mutation, they wondered if the alpha-syncline protein was in the lewy body and sure enough it was. So labs have been studying the protein lewy body. It aggregates into a very large protein, and when that happens the cell starts to die. This happens in the peripheral nervous system that innervates the gut in a subset of Parkinson’s patients. So there are a group of patients with PD that have this lewy body pathology but I don’t think everyone does. I’ll give you my opinion but it’s not Georgetown’s opinion. What we’re finding in the PD patients: they aren’t all the same. They might have more of a tremor in their hands but less problems initiating movement, or they could have a less severe tremor but have more memory problems. It’s wrong to group people together because then the therapies will become the same, and they can’t be because you’re going to have different types of tremors. I think you’re going to have the same thing with ET. People have tremors in different areas and are more or less responsive to different drugs. I recommend that you advocate with your physician to see if you fit in this bin with everyone else or is there something extra that needs to be done. We have found that we have this huge amount of microglia and then we get inflammation. We know this from imaging studies of Parkinson’s patients. There’s a specific thing you can put in the blood that microglia will bind to. What they see in Parkinson’s patients is when there is death of neurons in one specific area the whole brain starts to light up, and there’s inflammation. The same thing happens in Alzheimer’s disease. So that’s why we think this is an important link between many diseases. What we found is one particular structure that activates. Normally this small protein is found in the cells, that does not activate the microglia. So this structure has to be this one. We hope that as we get more data and work with other labs that are working to develop compounds to block the inflammation that it’ll be, not a cure, but an adjunct therapy to whatever patients are already having. We want to keep the immune response down because it’s really damaging other cells in the area. Peter Muller said there are two areas you can donate your brain: Columbia University and University of Arizona. They’re taking different approaches. What’s been interesting is that Columbia has found lewy bodies in ET and Arizona has not. It may be because Columbia is getting older brains. Dr. Maguire-Zeiss said studies have been done on microglia in mice. If we find something interesting, we go to human tissue. You have to wait before using human tissue until you are almost 100% sure. It’s so hard to get human tissue. Georgetown gets brains from Columbia & Harvard. The problem is not so much the diseased brains but control brains. Clinical neurologists have a lot of pressures such as insurance issues and pressures to see a certain number of patients. If they don’t, they won’t have a job for long. So this is a problem. And I think the brain initiative will only probably occur at a few unique places to start with – where they get support from both the hospital that they work in and a closely aligned university. What comes to mind is a program we’re starting, not that we’re the only ones. We have PhD students mostly in our program. I’m in the program called the Interdisciplinary Program for Neuroscience at Georgetown University. We like it because neuroscience is interdisciplinary. So we have biochemists, cell biologists, pharmacologists and neuroscientists and we all work together and it’s great. What we’ve designed at Georgetown is a track where you get a translational medicine certificate because we can’t really do a degree in it yet. So you do your PhD for instance in our department, neuroscience. Normally you would take a bunch of didactic courses, which are the core of neuroscience. You still do that. In your second year, where students would take electives they are really interested in, they do translational med – courses on how to do clinical research and design clinical experiments. Then when they get to their thesis normally they come to my lab and have a mentor who’s a clinician interested in bridging the clinical basic research. The research that we do is patient-based research with my (neuroscientist) basic science input. We’re trying this new program because we’re seeing that we we’re missing the gap. We’re getting a lot of basic scientists, a lot of clinicians, and very few MD, PhD’s because it’s a hard road and a lot of times the PhD work goes back to the very basic so they don’t get to translate. This is supposed to start next year. We’re pretty excited about it. You can do it in anything so if you’re a cancer biology PhD you can still do the translational stuff. In that case, your mentor would be someone in the Lombardi Cancer Center. The environment is hard for scientists because we have to get our own money to do our work. This new generation doesn’t want to face that. They don’t want to work 60 hour weeks for not a lot of money so it’s hard to get them excited. They’re excited in high school but they get burnt out somewhere along the way. Related Article: See-through brains clarify connections – Technique to make tissue transparent offers three-dimensional view of neural networks. The following is an article that was in the Vero Beach 32963 / February 14, 2013 Newsweekly by Siobhan McDonough, Correspondent. Hector Rocafort remembers the day 15 years ago when his right hand started trembling for no apparent reason and from that point on mealtimes were a disaster. “I couldn’t eat properly,” he said of his efforts to use a fork with his dominant hand. “While eating a salad, a piece of lettuce would fly in one direction, a piece of tomato in the other. 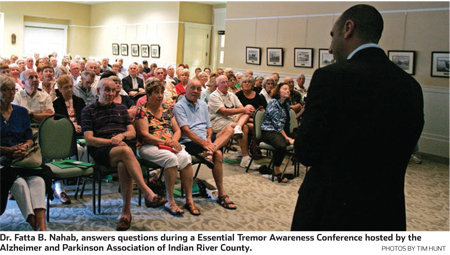 I’d be lucky if I could get a cucumber!” the 84-year-old retired police officer said last week at the Essential Tremor Awareness Conference hosted by the Alzheimer & Parkinson Association of Indian River County. causes, treatments and research associated with essential tremor, a progressive neurological disorder characterized by uncontrollable shaking of the hands and arms and sometimes other parts of the body including the legs, trunk, head, voice and chin. Some 10 million people in the United States have essential tremor. There is no known cause. Symptoms range from mild to severe and the condition affects mostly older people with symptoms worsening as they age. However, children can also experience essential tremor. Joan Marie Barringer, a professional counselor, was only five years old when she started to tremor. She would have occasional episodes, especially during gym class when she was tasked to walk on the balance beam. “I was terrified. My whole body would start to shake.” She didn’t know what she had and was unable to supply an educated answer to family members, classmates and others who queried, “Why are you so nervous? Why do you shake so much?” “I felt frustrated and very alone,” said Barringer, who was eventually diagnosed at age 32 and later realized that she wasn’t the lone sufferer of essential tremor. “It is a big secret for a lot of people,” she told the group, many of whom closely identified with her personal account of “feeling embarrassed and alone.” She encouraged people to attend support groups, to try a holistic mind, body, spirit approach to treatment in addition to a medical one, and to evaluate their diet and exercise. Dr. Roberta Rose, a neurologist who practices in Vero and Sebastian, also spoke to the audience, offering an overview of essential tremor. While the condition can be debilitating it does not shorten a person’s life span, she said. It also doesn’t mean someone will develop Parkinson’s disease if they have essential tremor, however some research suggests that essential tremor can also occur with other brain and nervous system problems such as dystonia, parkinsonism and certain nerve conditions passed down through families. There has been no medicine developed specifically to treat essential tremor, she said, however Propranolol, a beta blocker, and Primidone, a drug used to treat seizures, have been widely used and proven effective in some cases. Both drugs can have side effects. In studies, alcohol and Botox have also shown to be effective in reducing certain tremors in patients. There is no single test to diagnose essential tremor, but a person with frequent tremors should have a thorough physical exam, have blood work done and a family medical history taken. She also discussed deep brain stimulation, a surgery for those with severe tremors that’s done to inactivate the thalamus, a structure deep in the brain that coordinates and controls muscle activity, without purposefully destroying the brain. Experts think that the abnormal brain activity that causes tremor is processed through the thalamus. With brain stimulation, electrodes are placed in the thalamus during surgery. The electrodes are connected by wires to a type of pacemaker device called an impulse generator that is implanted under the skin of the chest below the collarbone. Once activated, the device sends continuous painless electrical pulses to the thalamus, blocking the impulses that cause tremors. Patients can externally turn the generator on or off with a special magnet provided to them. Stimulators may last for several years, and the generator replacement procedure is fairly simple. The stimulation provides moderate relief to about 90 percent of patients with essential tremor, studies show. Still, brain stimulation should only be considered in cases in which tremors significantly impair one’s lifestyle. Rose cautioned that surgery has risks, and the procedure is not for everyone. However anxiety-stricken Jerry Peterson, 71, of Sebastian, was about having deep brain stimulation in 2009, his tremors had gotten so bad – he had lost his job in retail, and his fine painting skills were greatly diminished – he felt it was time to face his fears in the hopes of a favorable outcome. 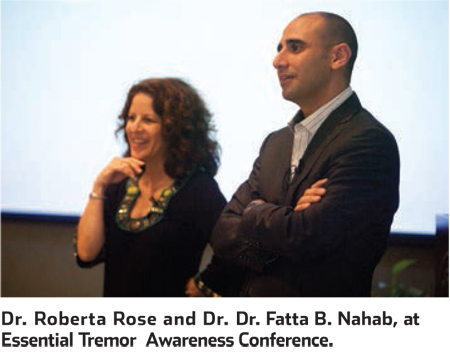 Dr. Fatta Nahab, a neurologist in Miami, wound up the conference with details on recent studies on essential tremor, and a status report. The bottom line: Whilst aggressive measures are being taken by researchers to pinpoint causes and origins of essential tremor, it remains largely a mystery.